If you are looking for a personalised golf pencils or a branded gold pencil, why not contact us today to find out the options available and to get an idea on pricing? Our top quality golf pencils are available in a range of ten difference colours, with varying pencil styles available including with or without eraser. One of the essential golf accessories, a golf pencil is a great way to promote your brand to customers, or to stock for selling to the public. And, the unit cost of the golf pencil is low enough for you to get great value - whether as part of your golf day budget, general corporate golf gift or for marking up to sell to the public. Corporate clients - Golf days and corporate golfing gifts. 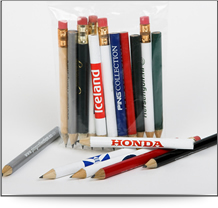 Golf Clubs - Packaged, branded personalised golf pencils for resale, gifts and prizes. Retailers - Plain, branded or affiliated branded golf pencils wholesale for resale. The golf pencil can be supplied in multiple colours, or a consistent colour on all the golf pencils. 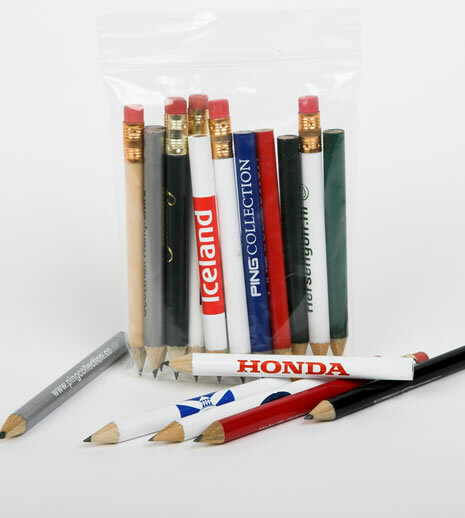 They can either be packaged or supplied as bulk golf pencils bagged for using accordingly. Supplied blank, or printed with your company name, golf club logo or sales message in your corporate colours, our golf pencils are imprinted using specialist golf pencil printers for maximum print quaility. Your golf pencils can also be packaged with golf tees and ball markers in any combination for a complete golf pack - an ideal complementary corporate giveaway to generate brand awareness at your corporate golf event.